The ears had immense significance to the Maya. They were believed to be conduits for spiritual energy, and thus ear flares had considerable value and importance in culture. Forms of obsidian, shell, ceramic and stone were worn in ear perforations. Some designs for daily wear are similar to standard solid plugs or thin tunnels of today, but the most prolific reminders of Maya body modification are the large ear flares shown in sculpture and craft. Ear flares have been part of human expression and body modification throughout time and across cultures. The flare’s physical purpose was to stretch the skin of the earlobe into an elongated circular shape; depending on each culture’s standards, this modification could meet physical standards of beauty, represent traits of character, or reflect a combination of the two. The material used to make the ear flare also played a large role in the owner’s social prestige. 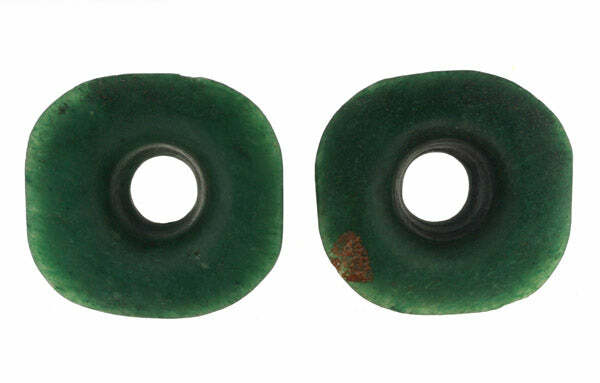 In the Mayan world, an ear flare derived from jade, a mineral more precious than gold to the Mayan people, was a display of wealth and power by the elite of the society. Labradorite is a low key gray stone with a big surprise. When cut correctly for proper angle, high quality material displays a bright flash of color(s). Colors from the blue and yellow-orange portions of the visible light spectrum jump forth from the darker base stone. Only a small percentage of all of the labradorite mined is of high enough quality for our body jewelry. Three pairs of bronze ear weights with select cuts of "Red Creek Jasper" reminiscent of the surface of Jupiter's moon "Europa." I've been working on this weight design concept for well over a year now, and I'm thrilled to finally make them available in their full size glory (I previously released several half-sized test pieces). Europa represents the first limited quantity run in a continuing release schedule of unique stones set in these beautiful bronze ear weights. This project was commissioned by a customer interested in reproductions of a pair of Mayan aventurine square front ear flares from my antiquities collection. While making them to his size with modern flares, I stayed true to the cultural references with Guatemalan jadeite material and identical front face contours matching the antique plugs. 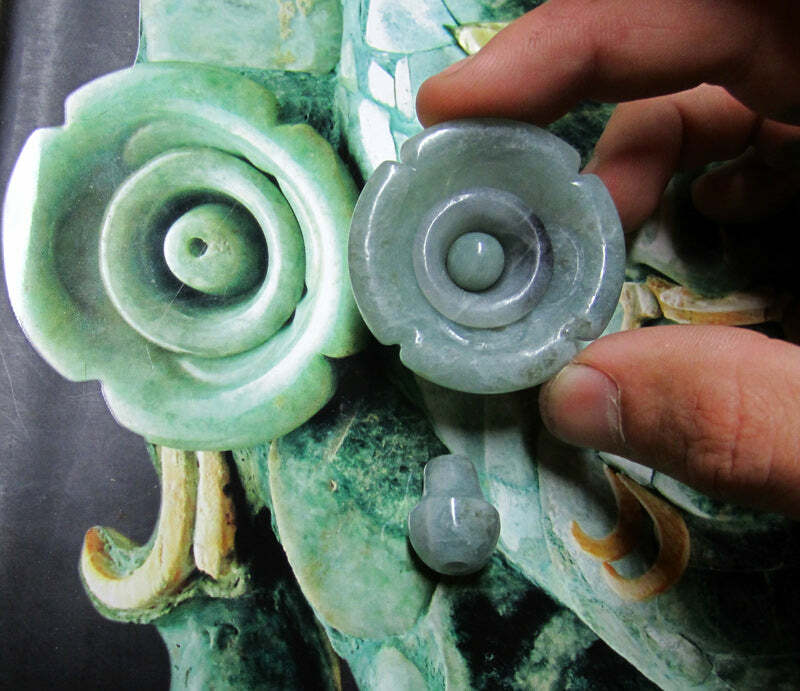 A local customer happily wore a pair of jade "Maya Flower" plugs we carved him until he began stretching again. Upon reaching a new goal size, we cut apart his old jade flower plugs and reused the faces to create a new pair with prong set faceted moonstone inlays. For some time now I have been interested in Prehispanic culture and jewelry, and so called "primitive" lapidary. After completing the first of what has become many personal interpretations and historical reproductions of Mayan stone plugs from traditional jadeite, I was interested in tackling the idea of ear flares that involved multiple pieces. Uniquely modern shell ear flares from the Gulf coast of Mexico. These pieces are double flared with slightly larger flares on one side (likely the front). Uniquely colored splotchy green to black jadeite ear flare with a somewhat squared off contour. The edge carving resembles four birds. Biconically drilled holes adorn four points on the face, and I see these as eyes, while the edge contours represent beaks, and the curved incised lines could be wings. Vibrant, very high quality green aventurine (green quartz variant) hollow ear flares with an irregular, rounded square shape. 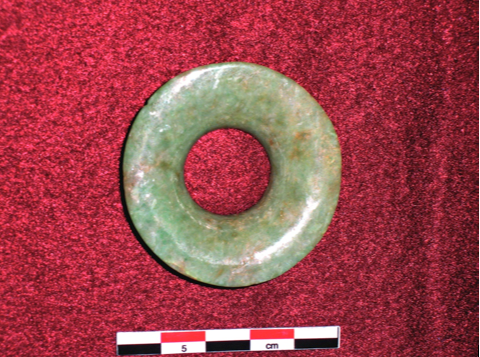 The color green, attributed to life, the rains, and the growth of maize, was very culturally important to the Maya, and stones such as jade and aventurine exhibiting vibrant green colors were held in high regard. An oval lip plug carved from jet material from the Inuit culture. The Inuit are a group of similar cultures that range from Siberia through Northern Canada and Greenland. This is a beautiful example of the traditional "t-back" oval labret which remains to this day the standard shape for stretched center lip piercings.